Additional resources for this book can be found at: www.wiley.com/go/davies/behaviouralecology This textbook helped to define the field of Behavioural Ecology. In this fourth edition the text has been completely revised, with new chapters and many new illustrations and full colour photographs. The theme, once again, is the influence of natural selection on behaviour an animal's struggle to survive and reproduce by exploiting and competing for resources, avoiding predators, selecting mates and caring for offspring, and how animal societies reflect both cooperation and conflict among individuals. Stuart A. West has joined as a co-author bringing his own perspectives and work on microbial systems into the book. Written in the same engaging and lucid style as the previous editions, the authors explain the latest theoretical ideas using examples from micro-organisms, invertebrates and vertebrates. There are boxed sections for some topics and marginal notes help guide the reader. The book is essential reading for students of behavioural ecology, animal behaviour and evolutionary biology. Illustrations note w. drawings (some two-col.) by Jan Parr and figs. This textbook helped to define the field of Behavioural Ecology. In this fourth edition the text has been completely revised, with new chapters and many new illustrations and colour photographs. The theme, once again, is the influence of natural selection on behaviour - an animal's struggle to survive and reproduce by exploiting and competing for resources, avoiding predators, selecting mates and caring for offspring, - and how animal societies reflect both cooperation and conflict among individuals. 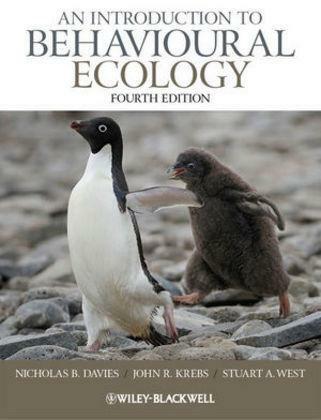 "[An Introduction to Behavioural Ecology, 4th Edition] Stands tall as the textbook to have in the field of Behavioral Ecology...I expect anyone with an A level in Biology, or equivalent, or an interest in Zoology without the qualification, could pick this book up and get a lot out of it...What this book is, is good science explained well, I scored higher in my behavioral ecology exam than I did in any other exam in my finals. I wouldn't put that entirely down to this book, but it certainly influenced things. The book is well printed, as you would expect, with great clear photographs used liberally, and a lot of graphs and diagrams. Nicholas B. Davies FRS is Professor of Behavioural Ecology in the Department of Zoology at the University of Cambridge and a Fellow of Pembroke College. John R. Krebs FRS is Principal of Jesus College and Professor in the Department of Zoology at the University of Oxford, and a member of the House of Lords. Stuart West is Professor of Evolutionary Biology in the Department of Zoology at the University of Oxford.